Once again, three generations of a single family will live under one roof. In 1955, a hard-working immigrant from Mexico named Fidel and his wife, Eloisa, bought a large duplex in what was once a large German immigrant community in the neighborhood of St. Michael’s Church (24th and Cherry Streets). Fidel and Eloisa had three adult children at the time. Their daughter, Guadalupe, lived with them in the lower flat, their son, Jesse, lived with this wife and children in the upper flat. Their other son, Antonio, lived with his wife and family a few blocks away. For the next 55 years, the house on 20th Street became the place where cultural traditions were observed and where holidays and birthdays were celebrated. Home to three generations of the Gómez family, the house was an anchor in their adopted country. It provided a stability that helped produce successful, well-educated grandchildren and great-grandchildren. And when Fidel and Eloisa passed on by 1992, Antonio and Lucia took over the lower flat and the house continued to be the physical center for this large extended family. This year it became clear that the remaining family elders needed to move to senior housing. So despite the universal sadness that leaving the house triggered in everyone, especially the 32 great-grandchildren, it became time to sell their beloved family home. 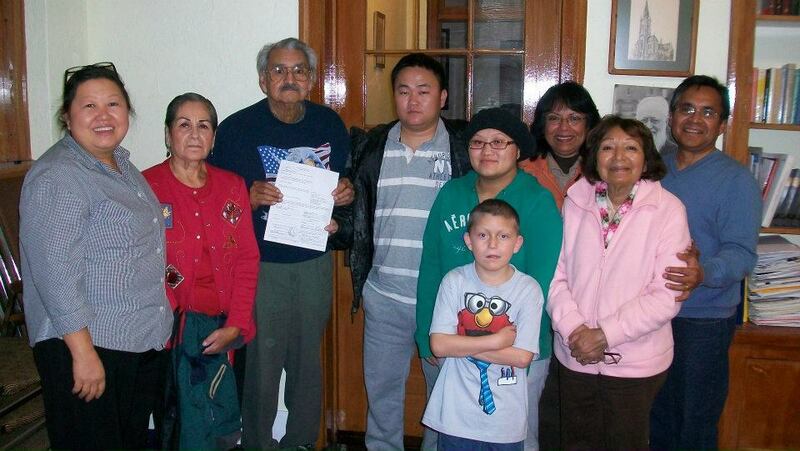 With the help of ACTS, the home was bought by another multi-generational immigrant family, the Vangs. Hmong refugees from Laos, the Vangs share many characteristics with the Gómez Family. Like Fidel, Phong Vang has worked hard all his life to take care of his family. Both families left their homelands for greater opportunities and a better life, and both come from strong ethnic backgrounds where family is prized and traditions are honored. And once again, three generations of a single family will live under one roof. Selling their house to the Vangs has made this transition much easier for the Gómez Family, and Eloisa Gómez, one of Fidel’s granddaughters, speaks for everyone when she wishes the Vangs all the happiness that her family experienced in the house. It is unlikely that this story could have had such an uplifting ending without ACTS’ involvement. When Fidel and Eloisa bought their home in the 1950s, the largely German community was quickly becoming racially diverse. The homes were big and the housing stock was well cared for by generations of large working class families. Many of the homes were owner-occupied. But today, like much of Milwaukee’s inner-city, the neighborhood is economically depressed and contains many abandoned and vacant homes, the very situation that spurred the creation of ACTS in 1992. Committed to empowering the poor and rebuilding inner-city neighborhoods — one family and house at a time — ACTS makes it possible for large, low income families to become home owners. By providing financial counseling, rehab expertise, and very low interest loans, it gives low income families the means to purchase homes and helps them make the homes safe and livable. More importantly, ACTS gives low-income families an opportunity to invest in themselves and their community. Just ask the Vangs and the many families ACTS has helped into home ownership.